Down in the sewers, Leo is busy doing battle with a trio of Warlord Komodo’s giant monitor lizards. After a grueling fight, Leo manages to slaughter all three monsters and turns to face the fully mutated Warlord Komodo. However, “Warlord Komodo” has a surprise for him; he isn’t Warlord Komodo! He’s actually the mutated monitor lizard the Turtles fought at Warlord Komodo’s castle. Having been rescued from the castle’s explosion by Pimiko and properly trained, he has taken on the name “King Komodo”. 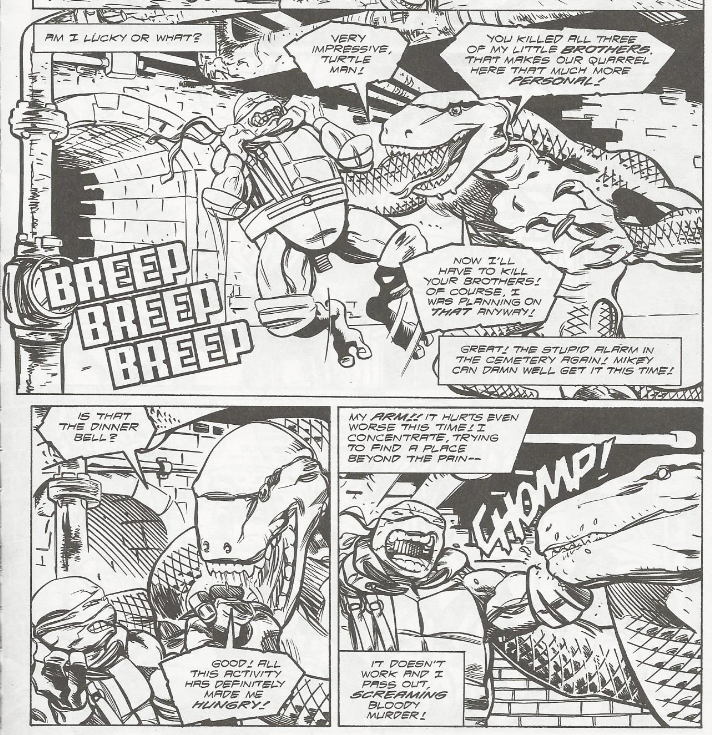 As part of Pimiko’s ruse, he began slaughtering the children of New York in the sewers in order to draw the Turtles to Leatherhead, where he laid in wait. With the exposition out of the way, King Komodo proceeds to chomp Leo’s left hand clean off and the Turtles passes out from the pain. At the sewer lair, the alarm from the mausoleum entrance is going off, but Mike chooses to ignore it and continue work on his romance novel, as he presumes it’s just another false alarm. Fully geared-up, Casey enters and encourages Mike to come with him to track Leo and Leatherhead down. And, if Leatherhead has indeed gone bad, then he can turn the gator into the authorities for the $10,000 reward. The two exit into the sewers and begin following King Komodo’s trail of corpses. Speaking of which, King Komodo is busy watching over Leo, who is coming to. King Komodo was kind enough to bandage Leo’s stump, though only to let the Turtle live long-enough to watch him slaughter his brothers as vengeance for the monitor lizard brethren the Turtle had slain. Still wobbly, Leo has a better plan: free Leatherhead and let the two giant mutant bruisers duke it out. Leatherhead is willing to fight for his friend Leo at first, but alas, he succumbs to King Komodo’s mental command over all primitive-minded reptiles. “Reminding” Leatherhead of how the Turtles destroyed his transmat device in the past, Leatherhead erupts and tackles Leo, dragging him to the bottom of a pool of water. Meanwhile, in the rooftops above, Raph (as Shredder) continues his training run with his Foot Soldier recruits. Raph’s beeper suddenly goes off, alerting him to the alarm at the mausoleum HQ. Raph decides that the Foot is his only priority and destroys the beeper. Raph then orders his Foot Soldiers back to Clan HQ to meet up with Cheng and a fresh batch of recruits. Unbeknownst to them, a cloaked, feminine figure stands nearby. She orders a pair of the Shredder Elite Guard to tail Raph and his recruits, but not to engage. She then narrates that she must go to the sewers to see how her other ally is doing. Down in the depths, Mike and Casey have stumbled upon King Komodo, but have opted to stick to the shadows for the moment. Beneath the water, Leo manages to prop Leatherhead’s jaws open with his scabbard, drowning him. As Leo surfaces with the limp Leatherhead in tow, King Komodo waits with a sniper rifle to pick the Turtle off. Mike and Casey leap into action just in time, knocking King Komodo into the drink, where the fiend retreats. At the mausoleum entrance, Don has returned from his trip to Pittsburgh and lands the Triceraton aircar into the hangar. Waiting for him, however, are a horde of black-suited spooks with guns who think he’s an alien! *This story is continued from TMNT (Vol. 3) #17. The story continues in TMNT (Vol. 3) #19. *The monitor lizard was mutated into King Komodo in TMNT (Vol. 3) #5. *Leatherhead’s transmat was destroyed (by the Foot, not the Turtles) in TMNT (Vol. 1) #45. 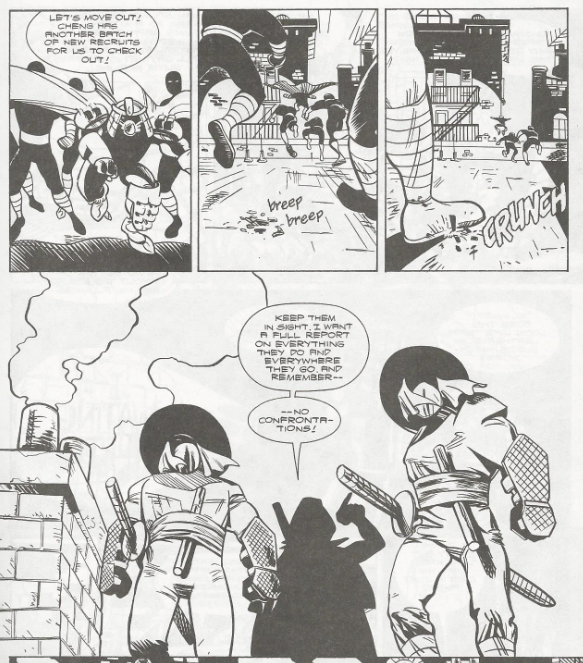 *A Shredder Elite Guard was previously caught spying on Raph and his Foot recruits in TMNT (Vol. 3) #16. *King Komodo will return in TMNT (Vol. 3) #25. *In the letters column, Carlson expresses interest in a TMNT/Spawn crossover. 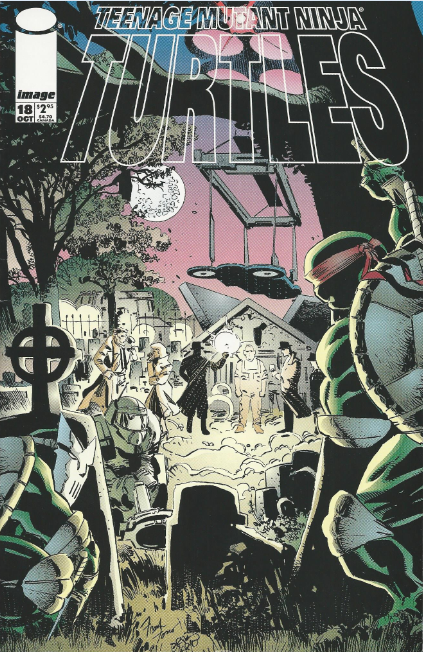 Though no such crossover ever occurred, officially, artist Frank Fosco did land the gig on the book by drawing a 5-page TMNT/Spawn crossover comic! It’s my opinion that the best arcs in TMNT (Vol. 3) so far have been the shorter, two-issue storylines. The longer, five-issue arcs, such as the Warlord Komodo storyline or the Deathwatch storyline, tend to meander and fail to end with any semblance of gratification. The two-issue ones, on the other hand, such as the kidnapping of Shadow arc or this King Komodo/Leatherhad arc, offer a tremendous punch without dragging things out or overstaying their welcome. While we’re denied a throwdown between King Komodo and Leatherhead, I thought the twist of having Leatherhead turn on Leo was a worthwhile surprise from the expected “giant man-eating lizards must fight each other” plot we were all probably anticipating when we opened this book. Getting to see Casey gear-up and effectively tackle the villain, albeit briefly, was another refreshing change of pace, as Casey is a bit underutilized in this volume. I also appreciated seeing him pal around with Mikey for a change, as you really don’t get to see Casey hanging out with a Turtle that isn’t Raph very frequently. So seeing how he behaves with some of the other Turtles can be very amusing (his making fun of Mike’s romance novel, for instance). Of course, the big milestone in this issue is Leo getting his hand bitten off, thus completing the last infamous “mutilation” of the volume. As with Raph’s facial scarring from the first issue, Leo just sort of shrugs the disfigurement/handicap off by the story’s end, as if he’d only scraped his knee. While Raph may not have been very concerned with his looks, you’d think a guy whose weapon of choice is dual katana would be a little upset. Still, I did get a laugh out of his banter with Casey on the last page, so it’s all good. While this issue lacks the introspective angle of the previous installment, it remains very action-packed, featuring the return of a classic character, the return of a surprise villain you weren’t expecting, some Casey Jones action and some mysterious Foot Clan machinations. All that and more great work from Fosco. 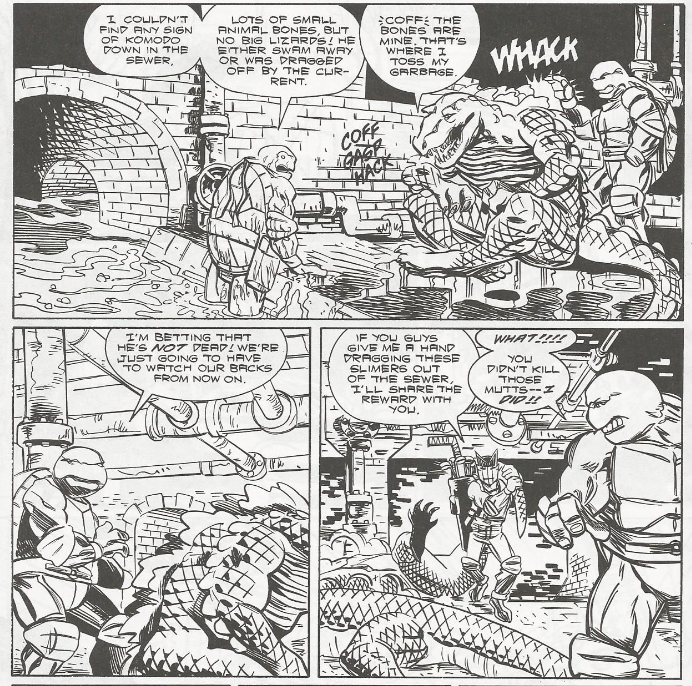 I’m particularly fond of page 3, the way he draws the dying monitor lizard trying to swallow Leo’s arm, katana and all. Some great inking from Heike on that scene, too! Damn. I know Casey has a daughter to feed, but Leo doesn't exactly have a steady source of income. They should've split the bounty.